Young man testing breathing function by spirometry. Take care about health. 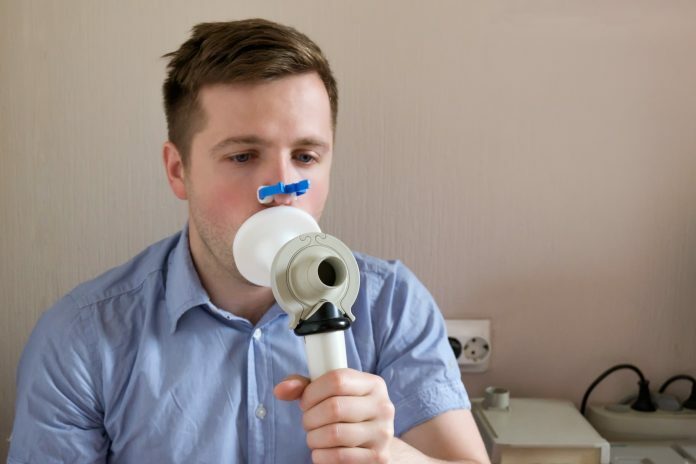 A collaborative team of researchers from Israel, Latvia, China, France, and the US have recently created an AI system that detects diseases from exhaled breath. In their study, the scientists found the device successfully detected 17 diseases with 86% accuracy. Led by Professor Hassam Haick of Technion-Israel Institute of Technology, the team collected breath samples from 1,404 participants that were either healthy or had one of 17 diseases. Among these diseases were lung cancer, colorectal cancer, head and neck cancer, ovarian cancer, bladder cancer, prostate cancer, kidney cancer, gastric cancer, Crohn’s disease, ulcerative colitis, irritable bowel syndrome, idiopathic Parkinson’s, atypical Parkinson ISM, multiple sclerosis, pulmonary hypertension, pre-eclampsia toxemia, and chronic kidney disease. The concept behind the project was to identify the specific exhalation components accompanied by each disease and to compare that to normal human breath. To detect these diseases, the researchers targeted compounds of human breath that are associated with specific diseases. These molecules, volatile organic compounds, are typically detected by the humans olfactory system in the complex process associated with scent. Haick and his team created a system, dubbed “NaNose”, that uses nanotechnology sensors to detect volatile organic compounds that are associated with each unique disease involved in the study. The system utilizes a two-layer system. One is the inorganic nanolayer that uses gold nanoparticles to conduct electricity, and the other uses carbon to control electrical resistance based on breath-compounds in the organic sensing layer. This resistance is changed based on the perceived volatile organic compounds, indicative of specific disease presence. Haick’s team is currently working to reduce the scale of their device and commercialize it with their “SniffPhone” project. In November of last year, SniffPhone was awarded the 2018 Innovation Award by the European Commission’s Horizon 2020. Haick’s device is likely to be one of many medical breath analyzers to hit the market in the next coming years, with the figures published by Grand View Research estimating the market to hit $11.3 billion by 2024. Current breath metric systems on the market are designed to detect alcohol, drugs, and diagnose digestive and respiratory conditions, but Grand View Research stated that clinical applications for these devices are expected to increase. Specifically, the organization noted that the “introduction of advanced technologies to detect nitric oxide and carbon monoxide in breath,” will lead to proliferation in medical breath analyzers on the market. With Haick’s teams’ new findings, it appears that volatile organic compounds may be an efficient way to detect many diseases when AI is applied to the system. Their innovative project and current work with SniffPhone argue that non-invasive breath analysis may become a tool to help physicians diagnose disease in the near future.